In 1709, in a war that would in our world be known as the Great Northern War but here known as the Russo-Swedish War, rather than going south into Ukraine for the winter and camping out there to gather local support (which he didn't find), Charles XII of Sweden goes toward Moscow instead. In our world, he didn't because he was cautious of the winter, but in reality the winter was mild and Peter the Great had very few soldiers or supplies in the city. Charles XII would have been able to walk in unopposed. So in this world, he does just that and forces Russia to surrender, burning half of Moscow to get Peter to comply. Peter's woes don't end there, as Poland shortly thereafter switches sides, signing an alliance with Sweden and invading Russia, taking back territory it had previously lost, including Kiev when, somewhat ironically, a harsher winter in 1711 destroyed a Russian supply train preventing them from holding back an offensive aimed at Kiev and forcing Peter to sign away yet more territory. In disgrace, Peter managed to keep control over Russia, but his body and heart couldn't take it, and he died in 1714 without bearing a son, leaving his niece, Queen Anne, on the throne as regent for his daughter, Queen Elizabeth. Queen Anne managed to pull Russia back from the brink and instituted an isolationist policy in regards to Europe, pulling back from European politics and conquering territory in Central Asia to keep the Russian people happy and keep expanding. While it pacified Russia, it also was the complete opposite of what the young Elizabeth felt. Elizabeth, in a shrewd move by Anne, was married to a prince in Prussia, Prince Henry, one of the younger sons of King Frederick William I and brother to King Frederick William II, known to our history as Frederick the Great. She took more after her father, looking to Europe as an answer to Russia's woes. However, unlike her father, she did not believe that the answer was to transform Russia to be more like Europe. Instead, she felt that they should do as Prussia did to Brandenburg and adopt European values and ideas and adapt them to Russian values and ideas already in place. No need to shave beards or take on new titles, simply take the best and adapt it to what is already in place. At the age of 25, in 1734, Elizabeth learned that Queen Anna intended to support her son, Ivan VI, as Tsar rather than Elizabeth as Tsarina. Rather than attack her openly, Elizabeth arranged for guards to take Ivan VI from Moscow to Vladimir, where he was to be raised until an adult, with Anna's approval. However, when the guards arrived, Anna was surprised to find that they were not her royal guards, but rather Prussian guards under the command of Prince Henry. They arrested Queen Anna and had her forcibly abdicated from the throne as Elizabeth, finally, assumed the position of Tsarina in 1735. After becoming Tsarina, Elizabeth began instituting her own series of reforms to Russia, basing them less of France and the Netherlands but more off of Prussia and Austria. The Russian Senate was reconvened and the boyar Duma was recreated under her to give both the rich and aristocrats voices in government while the army was completely overhauled with help from King Frederick William II, basing heavily off the Prussian model. In addition, prominent nobles could buy commands in the Russian Army to encourage further spending and gallantry in the army, and high-ranking officers were afforded a special position in the Senate. Along with these reforms, running from 1735-1758, Tsarina Elizabeth signed alliances with Prussia and Denmark against the dual alliance of Sweden and Poland that had held sway over Eastern Europe for the past 50 years. War, an eventuality at this point, came in 1758 as disputes between Denmark (who had lost a good chunk of Norway in the Russo-Swedish War) and Sweden flared up into warfare when Swedish troops crossed into Norway, intent on taking the Crown of Norway and uniting Scandinavia beneath the Swedish banner. 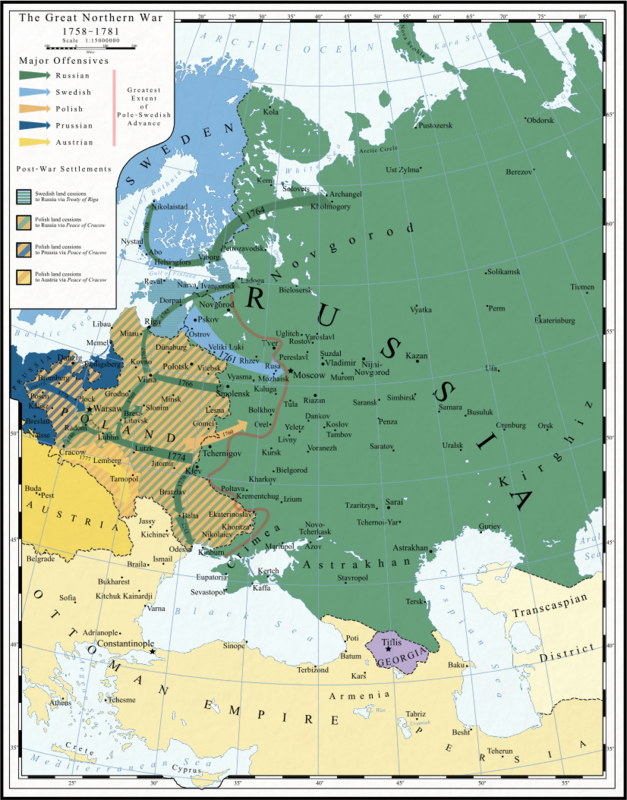 Russia, allied with Denmark, declared war on Sweden, as did Prussia, and Poland soon joined the fight as well, beginning the Great Northern War that would last, in some areas, until 1783. The war, at first, went well for Russia and her allies. Sweden was primarily focused on Denmark, who had transformed their armies as well and had won a major victory in the region of Skane in southern Sweden, forcing Poland to fight a two-front war. Russian forces quickly took Kiev in a devastating victory against the numerically-superior Polish army, and Prussia managed to take Danzig as well. Sweden, at the time, avoided war with Russia so as not to spread itself out, and still believed Russia to be weak. This was somewhat proven as a Russian force aimed at taking Viborg lost their supply train to a Polish attack and thus were destroyed by the small Swedish forces at Viborg. However, on the Polish front, Russia and Prussia were gaining ground while Denmark held its own. However, things changed in 1760, two years into the conflict, when a series of unfortunate events happened to Russia and her allies. Firstly, a Danish fleet carrying soldiers and supplies and warships to reinforce Christiana in Norway against a Swedish attack was lost to a combination of bad weather and a Swedish naval assault, smashing a hole in the Danish war machine and forcing their capitulation, giving up Norway and retreating from the war. In the same year, Austria, sensing weakness, declared war on Prussia to get back Silesia (which Prussia had taken in a previous war) and Sweden turned its war machine on Russia while Poland got its second wind due to a relief by the Austrians against Prussia and the recapture of Danzig, allowing supplies between Poland and Sweden to flow. A massive Swedish assault in 1761 smashed into Russia's northern flank and took Novgorod in a stunning defeat that wounded Prince Henry who had been defending the city. A join Polish-Swedish assault, aimed at creating a pincer move, closed in on Moscow, and for a time it seemed like Russia might fall by 1763. Russian forces were moved out from all corners of the world to defend the capital. However, a miracle came in just the right time: a heavy winter. General Winter was on Russia's side once more, and a devastating winter in 1762 halted all attacks on Moscow, allowing Russia to resupply. Prince Henry, now healed, led a counterattack on Swedish and Polish forces in early 1765, only to find that the forces were already wounded. In the confusion in the camps outside of Moscow, which were generally unorganized and rowdy, fights had broken out and the Swedes and Poles, each thinking the other was the Russians (helped by Russian skirmishers making them think that) turned their guns on each other, killing more than 2,000 men and wounded double that in the fighting. Prince Henry's well-supplied and well-trained soldiers absolutely smashed through the Swedes and Poles and forced them back from Moscow for good. At the same time, a colossal war between Britain and France in the Americas and Europe (a parallel to OTL's Seven Years War) broke out and forced Austria to abandon its so-far pointless attacks on Prussia, allowing Prussia to retake Danzig and invade Poland once more, as well as finally take the besieged Swedes in Pomerania. From 1765-1775, the war slowed as each side began a series of long assaults and withdrawals, primarily fought in Poland and Sweden as the two titanic sides clashed over and over again, as Russia and Prussia slowly forced the Poles and Swedes out of their own territory. A major victory came in 1775 as Charles XIII, King of Sweden, was killed in battle near Riga, causing both the city to fall and Sweden to fall into chaos as he had no legal heir or even close heir. In the chaos, Swedish forces in the Baltic were utterly destroyed, and Denmark re-declared war with a rebuilt fleet and army, quickly taking back Norway and even Scania, lost to them since the Thirty Years War. Sweden, from 1775-1777, went from a major contender in the war to a terrible loser, losing a massive amount of territory and being forced to surrender in 1778 in the Treaty of Riga, which granted Russia much of its Baltic territories and a good chunk of Finland, as well as the release of Norway and Scania to Denmark. Poland attempted to get in on the peace and save what land it still had (which was quite a lot), but was denied as Russia and Prussia were determined to grind them down. And, to add to Poland's woes, Austria, fresh off a victory against the Franco-Spanish-Bavarian alliance in its war alongside Britain, declared war on Poland. The next three years were spent wrapping up the war in Poland, which had waged for years from 1778-1788, Poland essentially fought a long series of losing battles as its pleas former allies and just about anyone else (including France) went unheard and it was faced with a total loss of territory. Fighting was more or less over by 1781, but revolts and rebellion was not put down enough until 1783 to declare the war over with the Peace of Cracow (signed by Tsar Ivan III who had replaced his mother Elizabeth since 1770), which divided Poland between the 3 allies. Austria got the smallest chunk, Galicia, due to its relative lack of participation while Russia got the lion's share and Prussia got a corridor to Danzig, plus enlarged Silesia and took bits of Poland up to Warsaw, which was taken by the Russians. In the end, the Great Northern War, sometimes called the Second Thirty Years War, was one of the most devastating wars in Europe before the 20th century. Total dead from battle, disease, famine, and more ranged from 1.5 to 5 million, and much of the Polish and Russian countryside had suffered destruction at some point in the war. However, on the bright side, Russia and Prussia had finally gained their place in the sun, utterly defeating their enemies and creating the most powerful alliance in Europe that could stand against even the mightiest foes, and allowed Russia to begins its path to superpowerdom in the 19th century and beyond.